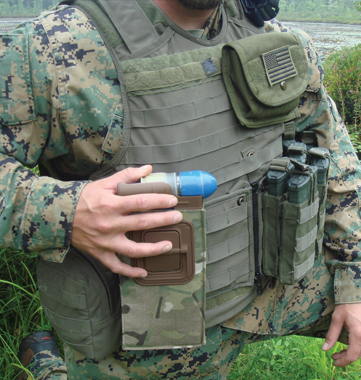 Mag-D® Grenade Dispenser | Defenshield, Inc. The MAG-D® system consists of a molle-adaptable grenade dispenser and transport pouch designed to give frontline troops easy access to 40mm HE-DP grenade loads. Worn outside the uniform and gear, MAG-D® dramatically increases the grenadier’s combat load – with each system holding and dispensing up to 5 HE-DP or TP rounds. 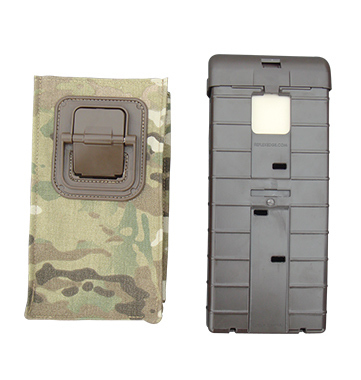 MAG-D® eliminates the need to carry rounds in cargo pockets or drop pouches with snaps that may seize shut. ACESS ROUNDS IN NO TIME, EVERY TIME. Designed for muscle memory training, MAG-D® dramatically increases a soldier’s rate of fire. MAG-D® enables the operator to remove rounds from the dispenser at the same location every time, ensuring that their hand is always holding the round in proper form to load the weapon. The dispenser provides a fluid motion, quick round release and has a built-in loading assistant for smooth and fast loading, so units spend less time managing ammunition and more time engaging the enemy. MAG-D® was developed based on firsthand combat experience. It is built to withstand today’s harsh combat environments. The dispenser is constructed of the toughest polymers available and utilizes a rust-resistant spring. The system features a free floating follower with guide ribs that allow large amounts of mud, sand and debris to pass through the drain holes to prevent jamming. MAG-D® is virtually maintenance free and requires no disassembly.